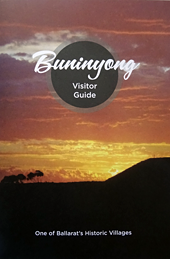 The indigenous Wathaurrung people gave Buninyong its name, meaning "man lying down with bent knee", as the Mount has that shape from a distance. 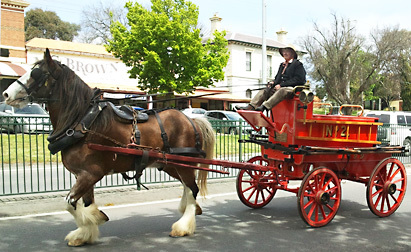 Founded in 1841, following the arrival of squatters in the district in 1837-8, the little town was the earliest inland settlement in what was then the Port Phillip District of NSW. The Rev. Thomas Hastie established a church and the first inland boarding school soon after and the town was surveyed in 1850. The June 2014 Newsletter of the Buninyong & District Historical Society contains an excellent paper, "Little Scotland: Presbyterian Enlightenment and Improvement at Buninyong", by Dr Anne Beggs-Sunter which discusses Rev. Hastie's contribution to the remarkable early growth of education in the Buninyong area. In August 1851, Buninyong's blacksmith Thomas Hiscock changed everything when he discovered gold, starting a rush that gave birth to Ballarat and the enormous riches of the Victorian goldfields. Large-scale mining activity brought formal government to the area in the form of an early Police Court, Warden's Office and Police Station, which still survive though long-outgrown. By 1861-2 Buninyong had 1200 people, five hotels, four churches, three schools, a Free Library, its own Botanic Gardens and a bank. The history of Buninyong has been written in several places around the town and it has a wonderful legacy of churches, shops, houses and public buildings still surviving from its early days. These can be freely seen, and some visited, during a leisurely walk around the township assisted by local guidebooks. Learmonth St (south side) in the early 1890s (collection Buninyong & District Historical Society Inc). Buninyong historian, Glenice Wood Lake, published the early history of the Scott family in Scotsburn: "The Land They Learnt to Love" in June 2018. 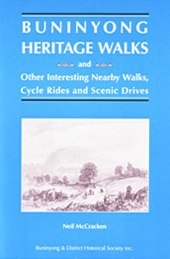 A fascinating story of early European settlement in this district, the book traces the arrival of Andrew Scott and his family in Sydney in 1838, their early years squatting on the Mt Boninyong run and their expansion into the Wimmera at Warracknabeal. The book is for sale at the Buninyong Information Centre for $30. 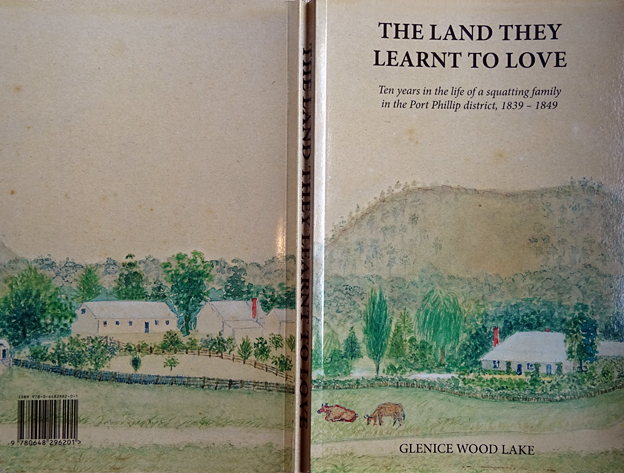 The cover depicts a painting of the early homestead at the foot of Mt Buninyong, ca 1870s. The artist is thought to be Sarah Scott, grand-daughter of Andrew Scott. The Buninyong and District Historical Society has published an excellent article in Buninyong's early mining history called Remembering the Gold Discoverers of 1851 in one of its newsletters: August 2005 Newsletter. Two monuments with plaques in Hiscock's Gully Road commemorate the discovery and mining of gold in Buninyong. One, erected in 2001 by the Buninyong and District Historical Society on the 150th anniversary of the discovery of gold in Victoria, marks the site of the earliest gold diggings in Buninyong. 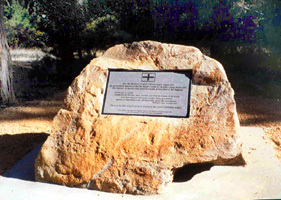 The other, erected nearby by the Ballarat Reform League in 2005, commemorates the Miners' Protest Meeting in Buninyong and marks the site of the first protest against the gold license held on the Victorian goldfields. The meeting took place in Buninyong in August 1851 and led to the formation of the Ballaarat Reform League and the Eureka Rebellion. The location of old gold mines around Buninyong can be found using the excellent GeoVic - Explore Victoria Online mapping application on the Energy and Earth Resources website. Click on GeoVic Version 3 (Anonymous) to open the black and white GeoVic map. Zoom in on Buninyong and activate the Layers tool on the top menu bar, then select Minerals then Mines and Mineral Occurrences to see mine shafts in the area. Refresh the map and zoom in closer if necessary (eg 1:10,000). For more detailed information about any mine, click on the grey 'i' button next to Mines and Mineral Occurrences (it turns black when activated) then centre the cross-hairs over the dot marking the mine shaft of interest. Other layers of valuable information such as topography can also be added. Buninyong 4th-graders produce some wonderful local history projects every year, several of which win annual wards from the Buninyong & District Historical Society. 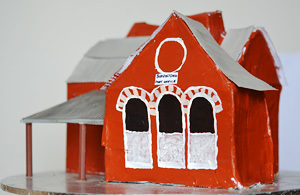 Here is is a 2010 model of the old Buninyong Post Office. Some prize-winning projects are displayed in the Buninyong Information Centre each year. Buninyong and Ballarat lost two wonderful local historians in 2018: Pauline Holloway in May and Joan Hunt in September. With boundless energy, enthusiasm and in-depth knowledge, both women inspired many people to take an interest in the history of our district. Pauline was a founding member of the Buninyong and District Historical Society and they both contributed immensely to our local history, leaving a legacy of knowledge and understanding that will be long-remembered. Thank you, Pauline and Joan.